I am going to do something a tad different with this post, and following a few comments I will list what I did each day, and then give you a slideshow of some images around the ship – it is grand! But I have so many little notes of things to share, and with the IPOD/IPAD courses I realized how easy it is to make notes. At dinner we sit in the same group, and our two hour dinners are great fun with great conversation, but at lunch time I have been able to sit with different people each day. Lunches in the Britannia Restaurant (I avoid the cafeteria buffet restaurants – they are nice, but that is not why you are on a cruise) have taken 1 ½ hours, and today I made so many notes on my IPOD for the first time (I carry it on trips now as a timepiece since I stopped wearing a watch decades ago – I don’t want to miss a train or boat). The fun thing I have found eating with different people is the sharing of experiences and the ideas I get for the future. For example a couple from London today told me that a few days before sailing they booked their trip, and the cost was about half price and included air to NYC. They arrived in time to catch a bus to the pier to sail with us. But they could have come days earlier depending upon flights. Yes, I have the website, and will watch it. They also told me that often they will take the Euro Star train from London to Paris for lunch, and then return in the evening. I can’t wait to do that. My first note I forget to tell you that my bathroom aboard QM2 is larger than my roomette on The Canadian train that I spent four days and three nights on last August. 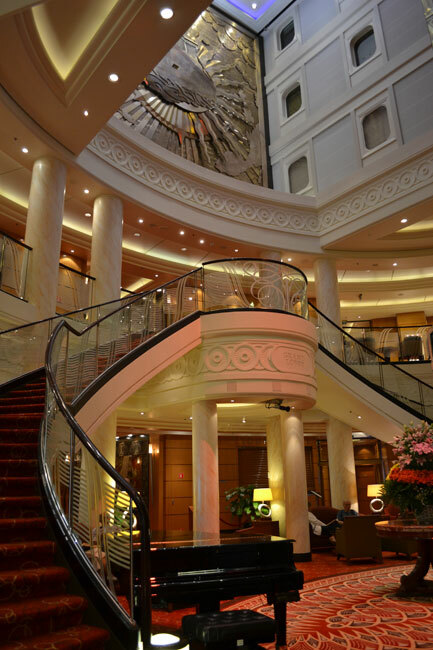 I also wanted to say that travelling on this ship with formal and semi-formal attire for dinner makes for a cruise that is not a “party boat” atmosphere that so many cruises to nowhere are. This is what makes this special and so much like things were in the 1950s, an almost lost elegance. Well, as John Tesh says, you want to buy experiences and memories, and that is what last year’s train trip was and this cruise now is. My advice today is to keep this in mind, and also that “it is alright to do nothing.” Cathy always enjoyed Dove chocolates with sayings inside the wrapper. What I just quoted was inside the first one I opened after I lost her. Sorting though the detailed itinerary of activities this is what I did on Thursday: at 10 I attended a lecture on the architecture of St. Petersburg; at 11 Nicholas Owen, ITN’s Royal Correspondent from 1994 to 2000, lectured on “Life with the Royals.” In the world’s only floating planetarium I saw “Search for Life” at 2:30, and at 3 PM listened again to Bill Miller (Mr. Ocean Liner) talk about “Maritime Royalty: The Cunard Queens.” His lectures are fantastic and I will pick up some of his books. From 4 to about 5:15 was the course “Using your IPAD” and I am going to become dangerous with my Apple equipment (David and Mari, you were right!!!). I skipped going to the 3-D move “Adventures of Tin Tin,” but after our fun two hour dinner sat in on the Royal Cunard Singers & Dancers show Viva Italia. Time then to turn in and advance the clock one hour (now a nightly event). Friday June 1st started with, yes another Apple seminar on Airplay, Apple TV and iCloud. At 11:15 Bill Miller’s lecture was “Getting There was Half the Fun: The Last Atlantic Liners.” After lunch at 2:15 the Royal Academy of Dramatic Art presented their version of The Canterbury Tales. Later at dinner I learned that in London they have wonderful shows for about 8 pounds – a fraction of a London Theatre ticket – now on my list when I get back from lunch in Paris. Would you believe at 4 I attended “iPads and the tablet computing revolution: Get Creative!” Then before dinner it was “Showtime: David Copperfield.” Not the illusionist, but ‘Unusualist’ an entertainer direct from the UK and very funny and clever. I did have some time in between these activities to take some images to share with you below. And I have also started to follow the history displays around the ship and also picked up the audio tour to fill in more of the details. This entry was posted in 2012-c - Queen Mary 2 & Northern Ireland - (May). Bookmark the permalink. Ok, now I want to go. I love the idea of bygone elegance and formal living (at least as part of a vacation). All those photos give the impression that ladies in gowns & feathers and gentlemen in tailcoats & top hats will glide into the picture at any moment. It’s neat you’re learning all about the ipad/phone/etc. I haven’t yet figured out the iCloud ~ will you please explain it to me when you get back? We both know that jealousy is a sin but if it wasn’t I would be after reading your lastest blog. It sounds like so much fun. Thank goodness you brought your IPad. The pictures you have of the ship are amazing. What a great adventure for you. Thank you for taking us along on this fantastic journey. So elegant. How is the weather? So much to see inside, it appears. Enjoy. Wow! I love the photos, so keep ’em coming! Also, could you give us a sample of what was on your dinner menu? Thanks!